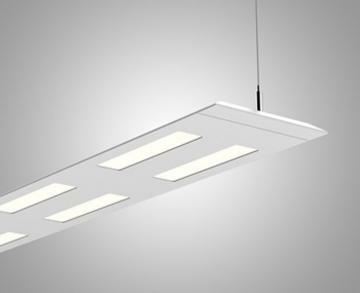 The Acuity Brands Peerless OLE4 Olessence is a suspended luminaire that combines direct-view OLEDs with LEDs. There are three available models, the 4' (8 OLED panels), 6' (12 OLED panels) and 8' (16 OLED panels). The Olessence uses rectangle OLEDWorks OLED panels. The Peerless Olessence is now shipping.